In the software RP Fiber Power one can simulate the impact of quantum noise on the pulses, which causes timing jitter and other kinds of noise. Pulse trains, generated e.g. in mode-locked lasers, exhibit some deviations of the temporal pulse positions from those in a perfectly periodic pulse train. This pheno­menon is called timing jitter and is important for many applications, e.g. for long-range optical fiber communications or for optical sampling measurements. Similarly, pulses from Q-switched lasers exhibit timing jitter, although the involved physical mechanisms are very different. Another type of timing jitter occurs in photodetectors, as also discussed below. In telecom systems, the relevant jitter can be that between data-carrying pulses and a clock signal. The latter may have been extracted from the data stream itself, or transmitted separately. In the former case, the low-frequency jitter is transferred to the extracted clock signal, and often is not relevant for detection. Timing jitter is related to phase noise in the optical frequency components of the pulse train. In the absence of technical noise, the jitter of a mode-locked laser is limited by quantum noise, but in most cases it is dominated by vibrations and drifts of the laser resonator. Important theoretical results, based on analytical and numerical modeling, are discussed in Refs. [5, 12, 13, 15]. Figure 1: Theoretically calculated quantum-limited timing jitter spectrum of a 10-GHz Er:Yb:glass miniature laser. In reality, the low-frequency noise (e.g. below 10 kHz) is higher due to technical noise. To some extent, relaxation oscillations (at ≈ 230 kHz) are converted into timing jitter. With a feedback system, the long-term timing drift can be suppressed, so that the low-frequency jitter is strongly reduced. The timing jitter of various kinds of mode-locked lasers (e.g. miniature bulk lasers, fiber lasers, or external-cavity diode lasers) can be very small (see Figure 1) – in some cases significantly smaller than that of high-quality electronic oscillators. This applies particularly to short time scales, where a laser can be used as a very precise timing reference (as a kind of flywheel). The long-term timing drifts can also be suppressed to extremely small levels using self-referenced frequency combs. The popular von der Linde method  is based on the evaluation of RF spectra of photodiode signals. It is fairly simple, but rests on assumptions (small fluctuation amplitudes, no correlations between intensity and phase fluctuations, etc.) which are not always well satisfied, and is subjected to various technical limitations. In particular, phase noise of the local oscillator of the electronic spectrum analyzer can affect the results . The phase detector method (see e.g. ) is often applied to actively mode-locked lasers, where the laser timing is compared with that of the electronic driver signal (residual jitter). It is not easy to achieve good suppression of the influence of intensity noise, particularly due to the phenomenon of drifting mixer offsets. Refined methods are available to measure relative timing jitter between different lasers, which must, however, be synchronized. The relative timing jitter of free-running passively mode-locked lasers (but also of synchronized lasers) can be measured with a versatile method based on a beat note of photodiode signals, generated with appropriate RF techniques and numerical processing . This method is very versatile, extremely sensitive, and relatively immune to a range of problems as frequently encountered with other methods. It is not affected by electronic oscillator noise and mixer offsets, and only very weakly by intensity noise. By comparison of different lasers, the absolute timing jitter can be obtained. For example, if one laser is known to have a lower jitter, the measured relative jitter is close to the absolute jitter of the other laser. If both lasers are very similar but uncorrelated, the recorded power spectral density at each noise frequency is twice that of a single laser. Very precise measurements are possible with a balanced optical cross-correlator based on a χ(2) nonlinear crystal . One may, e.g., compare the timing of two mode-locked lasers. The r.m.s. 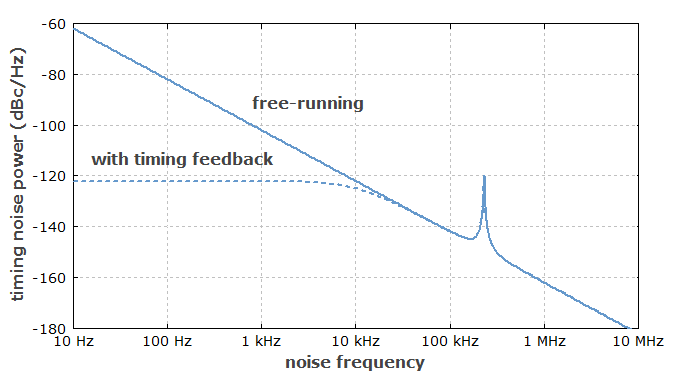 noise floor in a 10-MHz bandwidth, for example, can be well below 1 fs. Note that this method allows one to measure timing deviations only if the pulses have a quite low distance, e.g. up to 100 fs. Therefore, it is usually applied only to timing-stabilized lasers, exhibiting bounded timing fluctuations. In an actively Q-switched laser, there is some time delay between the opening of the Q switch and the generated pulse. The magnitude of this time delay is subject to fluctuations, so that a timing jitter results even if the modulator signal is very regular. The origin of that jitter may be fluctuations of the pump power, but thermal effects, vibrations and other disturbances can also contribute. A variation of the pulse timing by more than the pulse duration (Figure 2) is not unusual in such lasers. The jitter can be reduced e.g. with injection seeding. 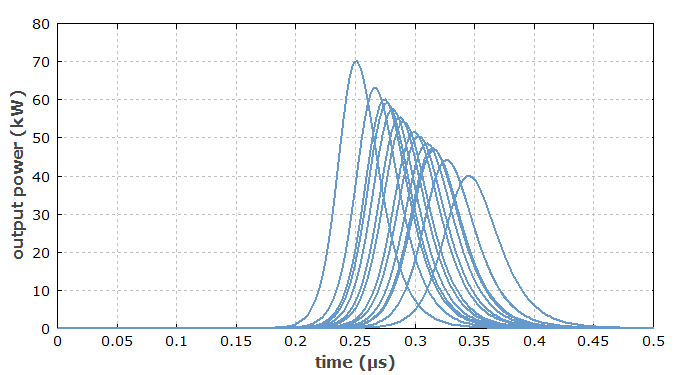 Figure 2: Simulated timing jitter of an actively Q-switched laser, caused by fluctuations of the pump power. The timing fluctuations are strongly correlated with those of peak power and pulse duration. In passively Q-switched lasers, fluctuations of pump power may lead to a larger timing jitter, as a pulse is emitted as soon as the laser gain becomes high enough to overcome the losses. On the other hand, noise of the pulse energy is reduced. If pulses from an actively Q-switched laser are used in a timing-critical setup, it can be a good approach to trigger that setup with a photodiode signal indicating the pulse arrival times, rather than with the modulator signal. Gain-switched lasers also exhibit relatively large timing jitter, compared with mode-locked lasers. When a photodetector such as a photodiode is used for measuring pulse arrival times, the photocurrent also exhibits some timing jitter, and the timing error in the measured result may be further increased by noise in the detector electronics. Details such as r.m.s. jitter and the shape of the probability distribution depend very much on the type of detector. For example, avalanche photodiodes in Geiger mode, used as SPADs (single-photon avalanche detectors), have other noise characteristics than ordinary photodiodes used at higher optical signal levels. The r.m.s. jitter of a fast SPAD can be below 100 ps for single-photon detection. Averaging over multiple pulses can be used to further reduce the effective jitter. In the detection of pulse trains for mode-locked lasers, saturation effects are often a limiting factor: the peak power must be limited in order to avoid saturation, and this results in a low average power and thus a poor signal-to-noise ratio. A possible solution is to use a source with a high pulse repetition rate, or to increase the repetition rate of an existing source by repetition rate multiplication using interferometers . Shot noise is a limiting factor the precision with which the pulse position (defined as a “center of gravity”) can be determined. For a given pulse energy, the shot noise impact is higher for longer pulses . Curiously, however, the shot noise limit for photo-detected pulses in a coherent pulse train is not determined by the photodetector's temporal resolution: due to correlations in the photocurrent spectrum, the noise limit can be lower for shorter optical pulses, even if this does not result in shorter detected pulses . 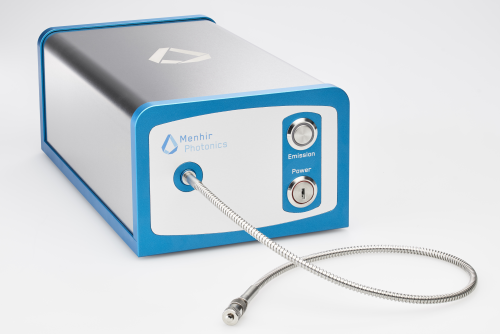 The MENHIR-1550 SERIES is the first industrial-grade, femtosecond laser at 1550 nm with GHz repetition-rate and ultra-low noise performances. Find more about the stability of Menhir Photonics’ products.